When the second phase of the Nené Field Development started 17km offshore of Congo Brazzaville, Maccaferri was approached to provide a pipeline protection solution. Our flexible ACBMs were chosen for their ability to conform to the shape of the pipeline and sea-bed. Within the Eni Spa development of the Nené Marine field, 17 km offshore of Congo Brazzaville, the pipelines on the seabed between the oil field facilities required protection and ballasting. The complete development of the oil field will take place in several stages and will include the installation of oil platforms, the drilling of over 30 wells, with a peak production of 140,000 barrels of oil equivalent per day. Once the oil has been extracted from the Djeno formation 2.5km below the sea-bed, it will be transferred for treatment on the existing Zatchi platform, also operated by Eni, via a subsea pipeline with a length of 17km. To protect this pipeline, Maccaferri supplied 240 Articulated Concrete Block Mattresses (ACBM) which will be placed over the pipes, increasing the mass of the pipe system and limiting movement. The mattresses will also provide a separation function between pipes at ‘cross-overs’ or junctions and afford protection from vessel anchor damage. 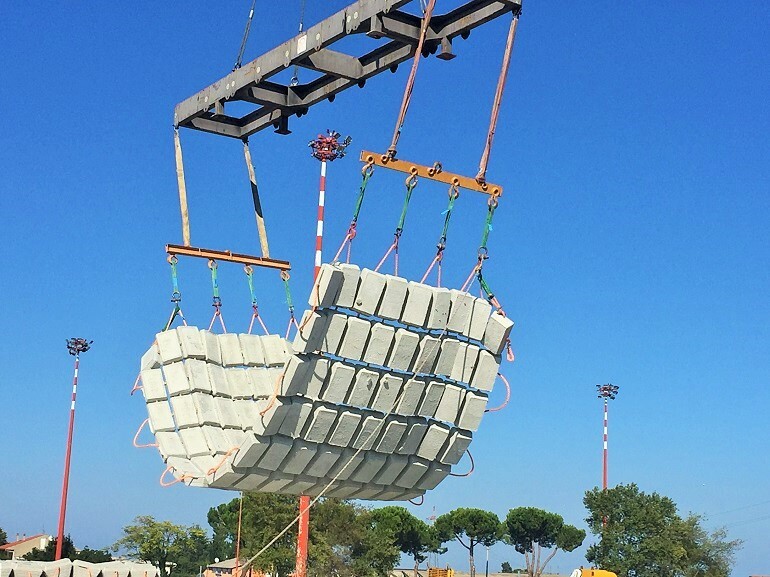 Our ACBMs consist of a mattress of individual concrete blocks, of a specific shape, secured together with cables. Due to their high degree of flexibility in both longitudinal and transverse direction, the mattresses are able to conform to the shape of the pipeline or sea-bed and weight the pipeline to protect it. The concrete mattresses have to ensure their functionality and structural integrity even in the case of accidental impacts; pipelines and their surrounding infrastructure must be adequately protected against dropped objects with the mattresses capable of withstanding an impact energy of 20kJ from a 500mm diameter object. Maccaferri issued third party Bureau Veritas certification on its ACBM units. For further technical information, please download the case history.